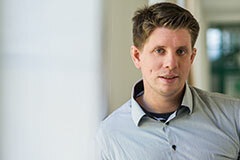 Peter Klimek is Assistant Professor at the Section for Science of Complex Systems at the Medical University of Vienna. His research focus is to explore and exploit the possiblities that big data and complexity science offer for the future of medicine. His work uses methods from network analysis, statistical mechanics, complex data analysis, and various simulation and modelling approaches to understand how we can improve, both, patient health and the health care system itself. His results include novel methods to quantify and predict the future health state of multi-morbid patients, statistical models for the influence of epigenetic factors on disease risks, as well as network characterizations of health care processes. His research interests also include complexity economics and socio-economic modelling. He developed a statistical test for electoral fraud, novel methods to measure systemic risk, as well as modelling techniques for emerging risks and for socio-economic impact analyses of new technologies. He obtained his PhD in theoretical physics in 2010 and his master in 2007 in quantum information. His work attracted broad media interest and was featured on various BBC programs (Radio 5, Scotland, World Service), Austrian Radios OE1 and FM4, magazines like Nature News, Science News, Scientifc American, New Scientist and other newspapers including Sunday Times, NY Times, Daily Telegraph, Berliner Morgenpost and Moscow Times.